Accurately or inaccurately, I've always considered myself a financially savvy guy. I avoid consumer debt like a pro, keep my wants in check, get all OCD about saving for retirement, and hunt for bargains like a steely-eyed warrior. But when I decided to chuck my 9-5 job eight years ago and commit to building a freelance business, I realized that I still had some serious learning to do. My new venture taught me a few brand-new money lessons and served as a refresher course on others. 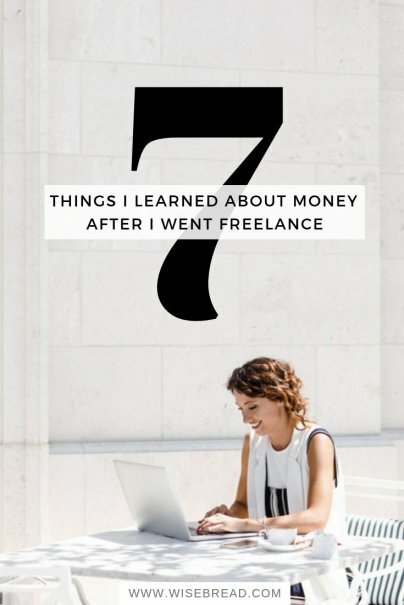 Here are seven things I learned about money once I went freelance. In a traditional work arrangement, a company produces a good or service and the management team determines how much employees can be paid in order to safeguard or maximize profits. Once you become your own employer, the distinction between payment and profit blurs — to your benefit. If you control costs and price your labor correctly, the profit can be a powerful force to fund expansion, pursue additional training, or enjoy more free time. Especially in the early days of any freelance business, income can be unpredictable. That's why knowing how to build a budget and live within it takes on a whole new level of importance. A well-structured monthly budget should leave a financial cushion to help you ride out late payments, adjust to unforeseen expenses, and squirrel away money for taxes. No matter how dogged your determination, lean months are inevitable in any one-person enterprise. Planning ahead, keeping overhead in check, and staying financially disciplined are make-or-break strategies. I apply the same principles to freelancing as I do to traditional employment — in today's economy, it's smart to be prepared for a layoff at any time and have six months' worth of income set aside for cash flow interruptions. When I became a one-man enterprise, the level of importance I placed on income tax awareness went from about a two to a solid 10. As part of the freelancing set, your tax obligations can change significantly. Learn all you can and retain a trusted tax advisor who caters to the self-employed. (See also: Freelancing: A Beginner's Guide to Doing It Right). Money is just labor in physical form, right? As much as I knew this before, going solo helped me understand it far more profoundly. Once my freelance career gained traction, I realized that I had control over my income in a new and direct way, and I could exercise that control to increase my billings and, in turn, grow my savings. Whether you're buying or selling, negotiating helps you get the best deal possible and it's one of the essential life skills every freelancer needs. Freelancing full-time has challenged my negotiation skills and forced me to take my skill level from "proficient" to "expert." Negotiating tactical discounts to forge new client relationships, working out the details of retainer agreements, and establishing realistic project timelines require flexibility and fortitude. As with all things financial, the details matter. Keeping track of contracts, hours, rates, outstanding invoices, and expenses means the difference between success and failure. Likewise, knowing how to project income from month-to-month based on accurate record-keeping helps me plan for major expenditures, invest in my business, and pay estimated taxes each quarter. (See also: 16 Time and Money Saving Apps for Freelancers). Remember, we keep learning (and relearning) money lessons as our lives and careers evolve. And when it comes to freelancing, experience is a quick and able teacher. The goal is be open to the lessons and broadly apply what we learn to build more financially independent lives. Do you work freelance? What has it taught you about making and managing money?